Yet another Solar Eclipse coming to India after a long time. Lets not miss it... But be careful !!! 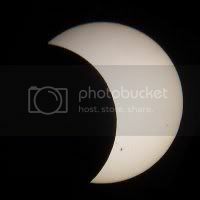 A partial solar eclipse will be seen in India tomorrow (Aug 1st 2008) while the north-eastern parts of the country will see quite a large fraction of the disc of the Sun, eclipsed by the Moon. "The partial eclipse will be seen in the north-eastern region, starting from about 4 PM," Director Nehru Planetarium, Rathnasree, said. The biggest and the last phase of the eclipse will be visible from most parts of the country, except Nagaland and Mizoram, where the eclipse ends after sunset, she said. The maximum obscuration of the sun will occur at Sibsagar in Assam. A total eclipse will be visible in Canada extending across northern Greenland, the Arctic, central Russia, Mongolia and China. The next solar eclipse -- a partial one -- will occur on January 26, 2009, but the phenomenon will be marginally visible from eastern and southern India. The eclipse can be viewed from all over the country. In Delhi, the eclipse will start at 4:03 PM and end at 5:56 PM. It will be maximum at 5:02 PM. In Mumbai it will from 4:27 PM to 6:03 PM, while in Chennai it will be visible from 4:40 PM to 6:07 PM and in Kolkata it will be seen between 4:18 PM and 6:02 PM where it will be relatively free from cloud cover. Know more about Solar Eclipse here.